One of the best all-round birches, the Jermyns White Birch tree (Betula utilis 'Jermyns') is a stunningly beautiful creamy-white-bark makes this tree a focal point in any garden. Medium sized in stature, this tree is notable for its display of catkins, which someway resemble lambs tail, which appear in early spring. 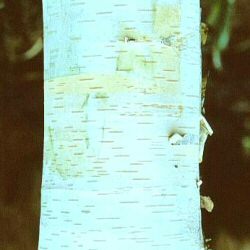 Early branches are mahogany coloured, but become bright white as the peeling bark matures. Jermyns White Birch is tolerant of most planting conditions.